The What: Yamaha Corporation Japan has launched Version 3 Software for MTX/MRX Series signal processors, which includes the addition of the Dan Dugan auto mixer to the MTX processors. The What Else: The MTX V3 signal processors now include Dan Dugan automatic mixer functionality, a technology that aims to solve many audio-related problems in conference situations. The Dan Dugan automatic mixing function raises the gain on microphones that receive input, and lowers the gain on microphones for which there is no input, automatically adjusting each input sound to create an overall constant mixer gain. Automating the microphone gain eliminates the need for troublesome fader operations when there are many microphones in use during presentations, or when even more microphones are in use at panel discussions. This solution also increases the gain-to-feedback ratio, to deliver sound with a higher level of clarity. The MTX3 features a maximum of four channels of Dugan automatic mixer. When used in conjunction with the feedback suppressor function, it is possible to build a simple presentation system that can be used without any specialized technical knowledge or skill on the part of the operator. For larger systems, the MTX5-D can be used with up to eight channels of Dugan automatic mixing for a single room space, or a maximum of four independent Dugan automatic mixing channels apiece when the space is divided in two. This offers flexible control for multiroom applications. The maximum number of automatic mixer channels on the Dugan auto mixer component for MRX7-D has been increased from 16 to 24 channels (multiple instances of Dugan auto mixer are possible). This makes it easier to adequately handle conference rooms where many participants are expected to attend, using many open microphones. Further, by using the AEC (Acoustic Echo Canceller) function built into the MRX7-D, echo problems that often occur during remote conferences are eliminated. Functionality has also been added for directly transferring data created on a PC, such as ProVisionaire Touch (iPad app) setting files, background images, PDF data, and more to an iPad. Further, V3 provides additional matrix size options for the MRX7-D Matrix Mixer, making it possible to design the channels of an audio system according to scale, making more effective use of DSP resources. This translates into greater usability, from system design to configuration and installation. 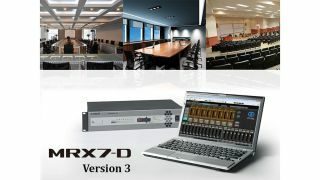 The Bottom Line: In addition to Dan Dugan auto mixing, the new version of the MTX/MRX Series offers support for smoothly running conferences with a simple user interface via wireless DCP using smart devices such as an iPad or Android device and the DCP series digital control wall panels.